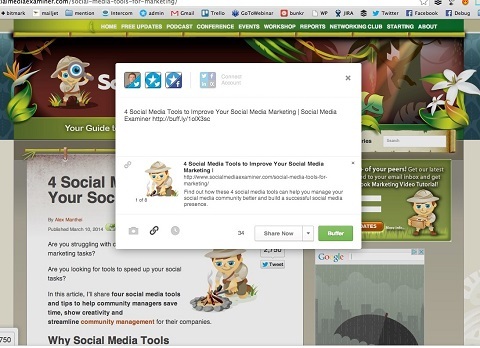 Do you use browser extensions to manage your social media? Are you looking for more browser-based tools? There are a number of options to help community managers kick normal workflows into hyperdrive. In this article, you’ll discover five web apps and extensions to turn your browser into a productive social media machine. Why Web Browser Apps and Extensions? With a bit of retooling, browsers can become the perfect place to manage your social networks and services by building a personalized combination of apps and extensions to handle the unique needs of your online presence. It’s up to you which browser you use, but I suggest Chrome. Not only is it the most widely used browser (at 56%), it’s also the platform where the most exciting web development is happening right now. Chrome has the most development going on right now. But the Safari, Firefox and Opera browsers are brilliant too. So keep reading for five social media tools that teach an old dog (your browser) some new tricks. Managing a brand’s Instagram account from your phone can be incredibly frustrating if you’re also a power user of the mobile app in your personal life. Constantly signing in and out of the app and remembering to make sure you’re signed into the right account can be a deterrent to using the platform. Trying to run everything and answer questions and comments from the web-based Instagram.com isn’t much better, as it requires you to constantly navigate to that one page. There’s a better way. Install this third-party Instagram extension for Chrome. This extension allows you to engage on Instagram without going to your phone or to the Instragram.com website. 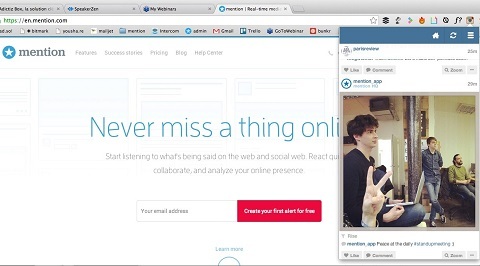 Bring Instagram to your browser for a better way to manage your community. The Instagram extension brings out an easy-to-access stream of Instagrams directly from the right side of your browser bar. You can like, comment, view videos, get desktop notifications and see what filters were used for each photo—all without picking up your phone or opening up another tab. It’s great for cutting out all the stress of managing your brand’s feed. Download and install the Instagram extension for Chrome. The description for Giphy’s extension puts it far better than I ever could: “GIFs. Anywhere. Anytime.” And man, does it deliver! Instantly search the entire Giphy archive for all of your GIF needs, right from the extension in your browser. 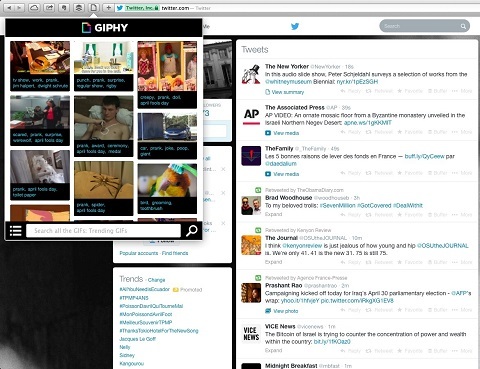 Once installed, just click on the extension and go to the main pop-up of trending GIFs. From here you can quickly search for GIFs by inputting a tag. Select the best animated GIF for the situation, and with one click, copy a nifty short URL to your clipboard to share in a Twitter reply. Quickly click to copy a GIF’s short URL for a Twitter reply. GIFs are one of my favorite resources for conversations on Twitter, and Giphy makes it easy to add a bit more emotion and dynamism to everyday communications and customer support on social media. Best of all, Giphy is totally free and they’ve got tons of ways to implement their database. Download and install the Giphy extension for Chrome, Firefox and Safari. Most people know Bitly as a service for shortening links. While this is most certainly at the core of what they do, it doesn’t even begin to scratch the surface of everything that their extension and bookmarklet let you achieve. If you’re used to other bookmarklets like Pinterest’s, you’ll be instantly familiar with how to use Bitly. A bitmark comes with many more options than your average link. You can save links as bitmarks to organize them into bundles around similar topics, gather data and real-time statistics on them and see which of your friends have already shared a certain link. 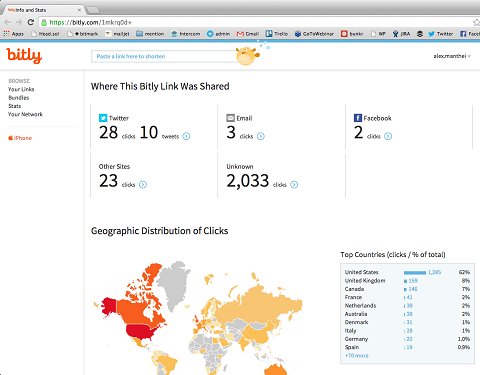 Bitly is chock-full of rich data surrounding your links and where they’re shared. 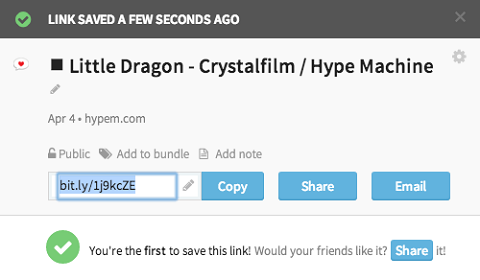 You can add notes to the link you save, directly share the page or content from the pop-up and even customize the link’s name by clicking on the pencil next to the shortened link. Like the Buffer box, Bitly has tons of options right off the bat. Bitmarks also add a lot of analytical value to something so simple (and old-school) as a hyperlink. 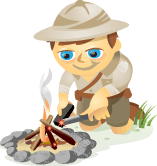 Just add a + sign to the end of a Bitly link to get all of its stats. Who knew you could innovate so drastically on something so familiar? Download and install the Bitmark extension for Chrome, Firefox and Safari. In my last post, I briefly mentioned Buffer as one of the apps to integrate with Zapier, a service that automates and connects apps. With such strong support for apps, extensions and extras of their own, Buffer turns web browsers into productivity hubs. Buffer has an extension for their app in each browser, but the experience is the same no matter where you use it. Buffer allows you to post content onto all of your social networks at predetermined times in the future. You first sign up for your Buffer account, fill up your Buffer queue with the content you want to share and then choose when you want to publish it. For example, you can choose an auto-posting schedule every few hours or you can specify a targeted time to post something on multiple networks. This is great for weekends or when you’re busy or away from your computer. Buffer lets you plan the future around your own unique messaging needs. Buffer has an incredibly refined social sharing dialog box. After you install the appropriate browser extension, simply click on the Buffer logo on the side of your browser’s address bar and you can select which networks and apps to post to and when, right from the Share dialog box that pops up. 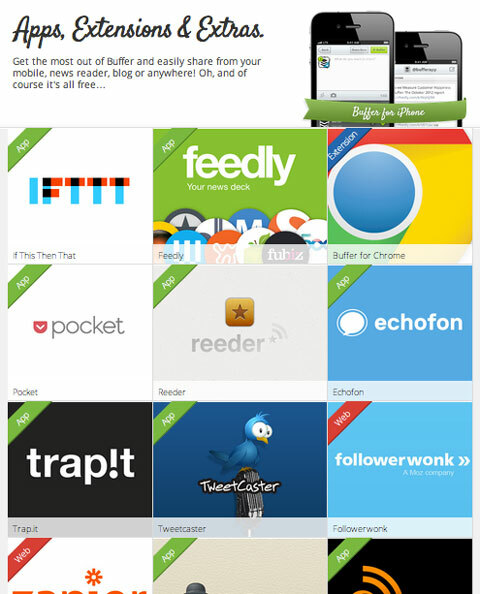 Buffer integrates with a lot of great apps and services. 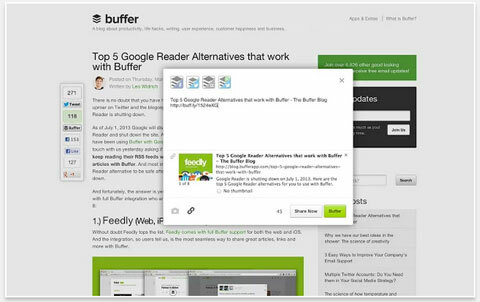 Download and install the Buffer extension for Chrome, Firefox, Opera and Safari. Riffle blew me away the first time I saw it. 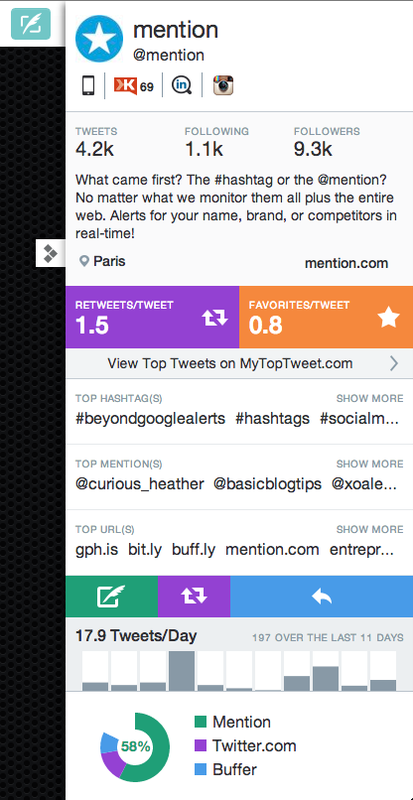 It turns your browser into a powerful Twitter analytics platform. A one-stop shop that lets you see everything you’ve ever dreamed of knowing about your Twitter profile and performance, as well as anyone else’s. It’s staggering to see how much information Riffle seamlessly brings to the fore, all in an easy-to-read, logical manner. Get real-time engagement and activity stats, along with interests, top URLs, mentions, hashtags shared and things like Klout score and other social accounts with a single click of the Riffle icon next to a user’s name. You can even right-click a Twitter handle wherever you see it, no matter what website you’re on. Looking up information on a Twitter user has never been so easy. Any time you’re browsing, you can pull out the sidebar and search for a Twitter @username to find the things you’ll need to know to make interactions with your users more personal and meaningful. Riffle launched recently and already has an impressive list of integrations—15 platforms in all. The app fits perfectly with Twitter, no matter how you use it—and that’s no small feat. But perhaps its greatest strength is how natural it feels. Download and install the Riffle extension for Chrome. Get more out of your social media marketing. For the fastest results, move your social media tasks back to the web browser where they belong instead of visiting each network, over and over. Combine these browser tools to take your scheduling, analytics gathering and real-time community management to the next level. What do you think? Have you used any other app extensions in your browser to stay updated and complete your tasks more efficiently? What tools can you share? Leave your questions and comments in the box below. Alex Manthei is the Community Manager at mention, a media monitoring app that lets you monitor, react, collaborate, and analyze your online presence. He’s based in Paris and edits twowordsfor.com.